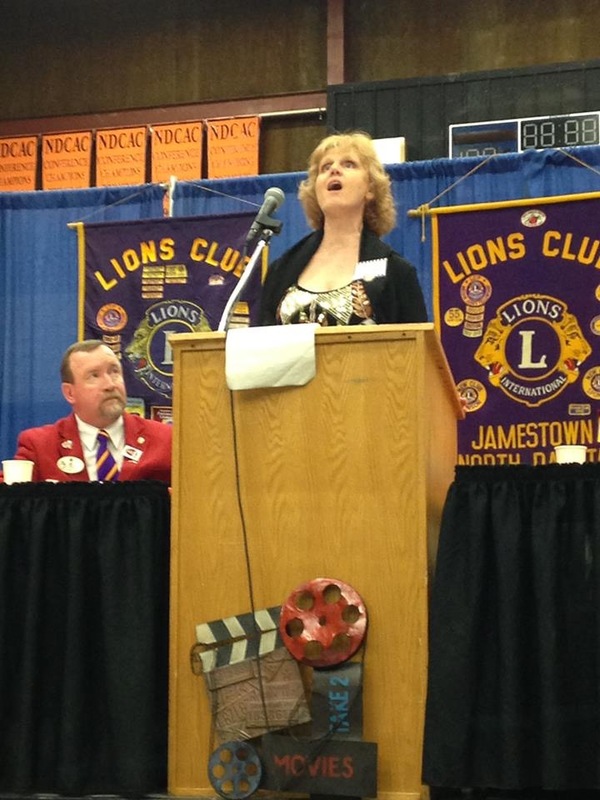 Coming home to the North Dakota State Lions Convention this past weekend was like finding comfort food waiting after a long day at work. This was the first opportunity for Kathy and me to personally thank many of the Lions who had supported us during the campaign last year. There were many hugs and handshakes as we celebrated our friendships with Lions from across the state. 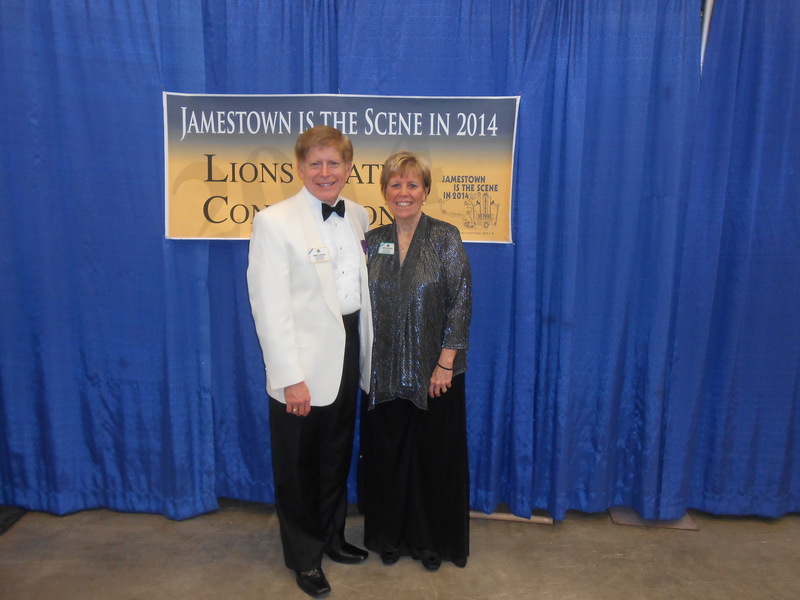 The Lions of Jamestown, New Rockford, Carrington, Medina, and Valley City served as local hosts. Across the board, they worked well together to assure that everything ran smoothly. What made the convention even more special was the fact that Lions from both of the Saskatchewan districts—5SKN and 5SKS—along with both of the South Dakota districts—5SW and 5SE—attended. Thanks to Vice District Governor Garry and Lion Gail Jopko, District Governor Murray Linner, Past Council Chair Rick and Lion Maureen Meston-Pockett, Council Chair Ken and Lion Donna Wetz, and District Governor Dennis Van Asch. Their sincere support was appreciated. 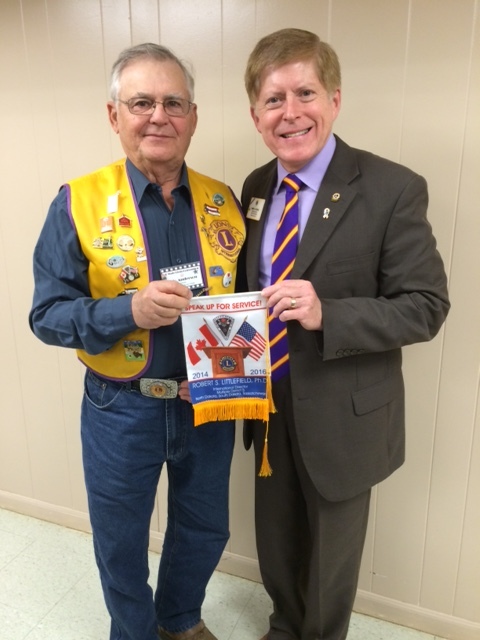 The opportunity to nominate Lion Keith Zeutschel from the Horace Lions Club for the position of 2nd Vice District Governor Elect in District 5NE was a real pleasure. I have worked with Lion Keith on several service/fundraising projects and he has a Lion’s heart. His goals of improving communication and building teamwork fit right in with the current district leadership team’s goals. 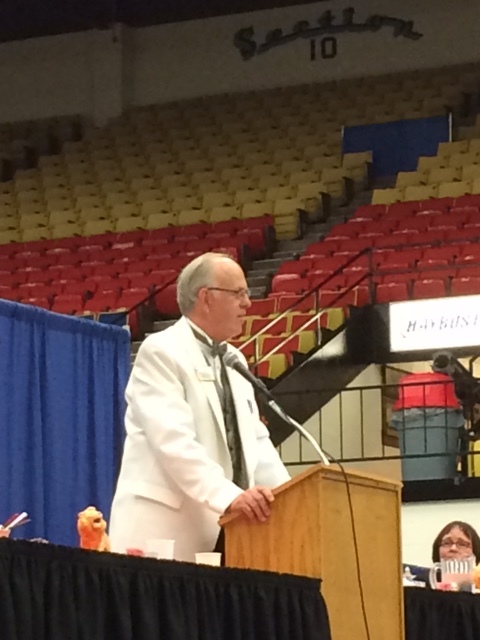 He will be our District Governor for the Lions Centennial in 2017. 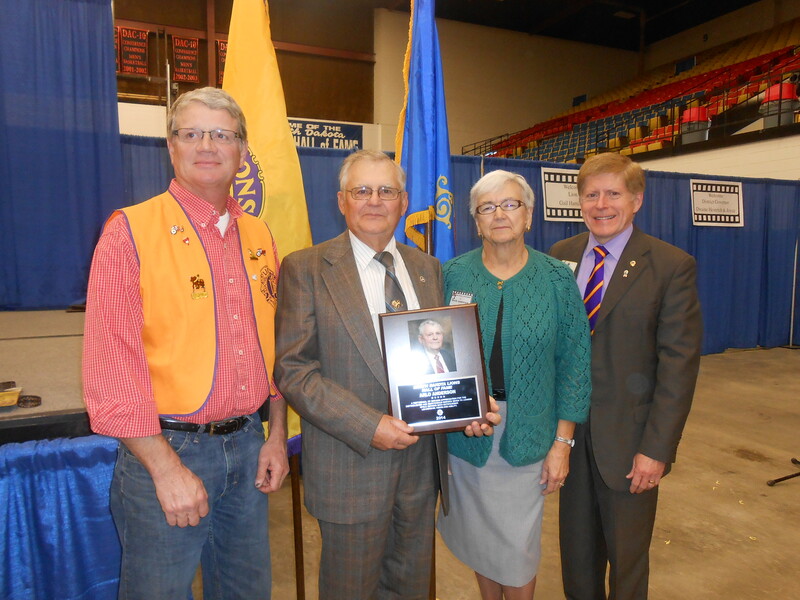 At the luncheon, Past District Governor Garry Freier presented Lion Arlo Anderson from the Chaffee Lions Club for induction into the North Dakota Lions Hall of Fame. I was given the honor of presenting him with his plaque and ring from the Past District Governors’ Association. Earlier in the day, when I presented him my friendship banner, he told me it was the first one he had been given. It warmed my heart to see how much Lion Arlo was touched by the kindnesses and recognition he received from the Lions of North Dakota. Also at the luncheon, the delegates were moved to tears by the story and musical talent of Lion Gail Hamilton: a motivational speaker, author, operatic singer, and 2013 Ms. Colorado Senior America….and, she is blind. “Gail’s story is one of pain, loss, suffering, depression, faith, survival, hope, perseverance, resiliency, activism, and achievement. Gail was born two months prematurely at a birth weight of just over two pounds. Both she and her twin brother were placed in an incubator and given too much oxygen, which destroyed most of her vision. Luckily, her brother was unaffected and soon began to thrive. However, by age eleven, Gail was totally blind. Not only did Gail face discrimination in education, but also in her own family. Her parents did not support her financially as she pursued a college degree. A series of painful surgeries on her eyes, the death of her mother, and the loss of her house all occurred within a three-month period of time. It was a low point in her life and she suffered physically, economically, and psychologically. Somehow she stopped listening to all the negativity, trusted in God, and became an advocate for herself. She began to believe in her own abilities not in her disability. Gail became a piano teacher, therapist, and an incredible vocalist. That voice that was buried deep within found its way out and in a big way. Gail broke into song for us and performed an aria that brought us all to tears. She is a powerful, skilled, and talented operatic singer. Stunning. Emotional. I felt some guilt as a teacher who shares a profession with Gail’s teachers who constantly held her back, failed to encourage her to follow a dream, and had no faith in her. 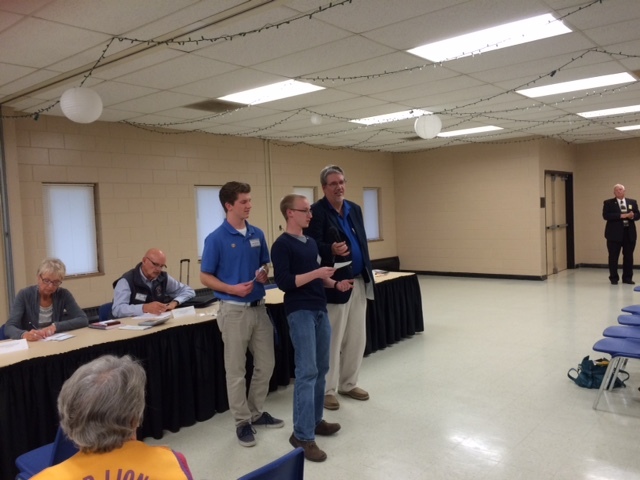 Later, at the State Meeting, I had the opportunity to present three Melvin Jones Fellowships to deserving Lions: Past District Governor James Ruff, District Governor Arlen Fetch, and Lion Sherry Fetch. From that experience, I can tell that being able to present awards on behalf of Lions Clubs International will be one of the special joys of being an International Director. 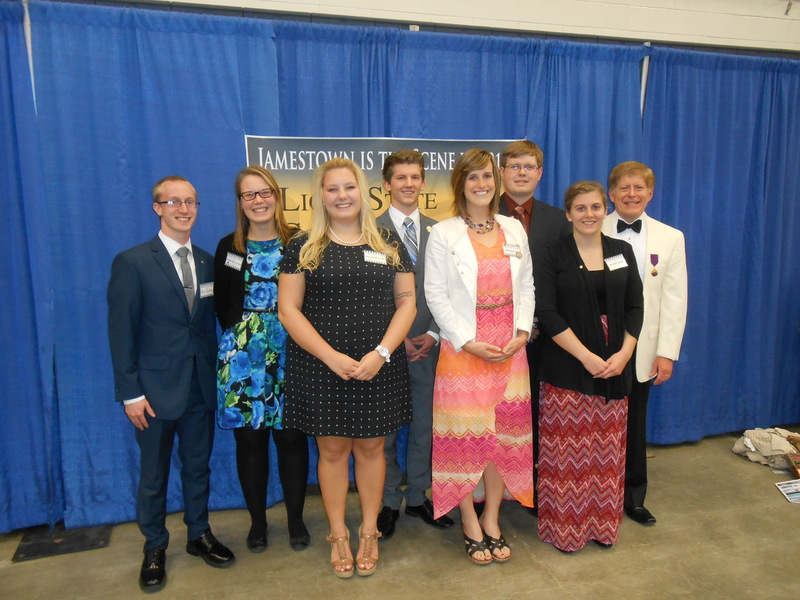 Another pleasure for me was watching the seven members of the NDSU Fargo campus Lions participate fully in all of the convention activities. As usual, they brought enthusiasm and energy to every conversation. In the Parade of Green, club president Peter Crowley and Lion Max Newstrom presented the club’s donations to the Lions Foundation of ND, Lions Eye Bank of North Dakota, Service Dogs for America, and Leader Dogs for the Blind. The NDSU Lions also helped to raise over $700 from the Lions of North Dakota for the One Shot, One Life Measles Initiative sponsored by the Lions Clubs International Foundation. They are inspirational to everyone they meet. 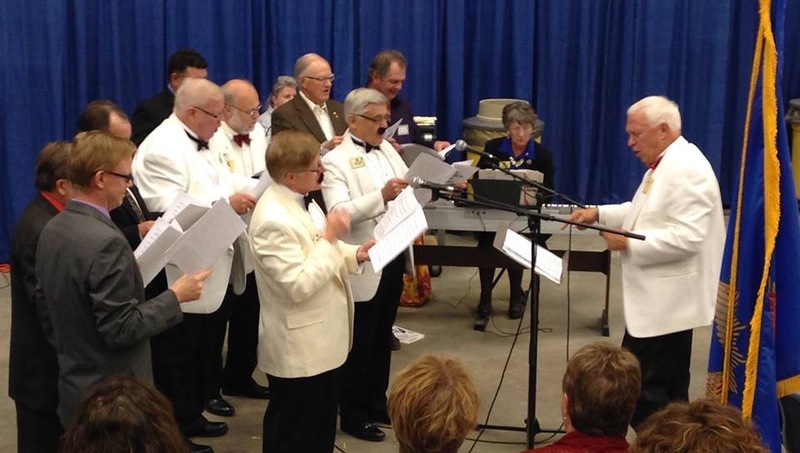 At the evening banquet, under the direction of Past District Governor Craig Wollenburg, the Lions Chorus performed three vocal selections, including, “If You’ve Only Got a Mustache.” It was fun to be part of the chorus and feel the appreciation of the audience as they stood to join in the final verse of The Battle Hymn of the Republic. International Director Mike Molenda and his wife, Linda, were the official guests representing Lions Clubs International. ID Mike did a great job of sharing the goals of International President Joe Preston to “strengthen the pride.” He commended clubs for positive membership growth, and encouraged everyone to continue their service on behalf of the less fortunate. He ended his presentation with a powerful message for Lions to continue striving when their arms grow too weary to reach for the unreachable star. It was great to watch ID Mike in action because Kathy and I will be traveling to Moose Jaw, Saskatchewan next week for the District 5SKS Convention. We will be standing in for International Director Yves Leveille who is scheduled for heart surgery on October 28th. We wish ID Yves well and pray for his speedy recovery.